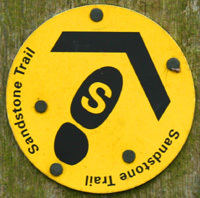 Sandstone trail challenge — ready for take off! Well the planning is in its final stages, the water jugs ready and the coach is warming up. 127 runners and walkers are thinking about which t-shirt to wear, whether and where to vaseline, which shoes to use and how many packets of jelly babies they need to buy. After a lot of hard graft from a few people we’re pretty much ready to relaunch this fondly-remembered event. Several members of Helsby RC have had a bit of a thing for this route, both recently and further back. Indeed we’ve had quite a few completions in respectable times (records here) over the last weeks and months. It’ll be great to get the event back on.